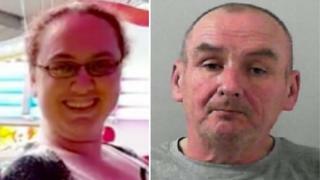 A jealous worker who stalked and strangled a colleague he was obsessed with has been convicted of her murder. Heather Jordan's body was found in Lyngford Park, Taunton, by dog walkers on 18 February. Martin Corns, 52, had denied killing her in a fit of jealous rage after she spurned his advances and claimed he had been stealing petrol when she died. At Exeter Crown Court earlier, Corns was found guilty of murder and jailed for life with a minimum of 17 years. Judge Brian Forster said Corns, of Taunton, had confronted 34-year-old Ms Jordan in the park with the intention of killing her. "You strangled the person whom you described in letters as 'my beautiful princess'," he said. "You attempted to make it look like she had been robbed. You were motivated in part to stop the deceased making a complaint about you." Image caption Corns admitted he had watched Ms Jordan's house and said it was "creepy and strange"
The court heard Corns had become obsessed with Ms Jordan after meeting her at Boots, where they both worked as cleaners. They started a non-sexual relationship, which she described as "committed friendship", and the prosecution told the court he killed her after she told him she wanted to stop meeting him. Corns bombarded Ms Jordan with more than 2,000 texts and calls, watched her home, followed her around at work and became increasingly possessive and jealous, the jury heard. He murdered Ms Jordan while she was walking from her home to her weekend cleaning job at the Priorswood Co-op at about 05:15. A torn-up love letter was found scattered around her body and the killing was made to look like a robbery. She was found in a park shelter by dog walkers. Ms Jordan's mother Jennifer Rigby told jurors she had been about to lodge a complaint of harassment against Corns with bosses at Boots. She also said she did not like receiving a dozen red roses from him on Valentine's Day, two days before the murder. The jury heard Corns was convinced Ms Jordan was seeing a supervisor at Boots and refused to accept her repeated denials. Det Insp Mike Buck, who led the investigation, thanked Ms Jordan's family and friends for "their courage and the dignity they showed at court". "A major part of the trial was CCTV provided by local businesses and private householders for which I am very grateful," he added. Speaking before the trial, Mrs Rigby said her daughter had a kind heart and liked to help anyone she could but had suffered bouts of depression. "She was basically a good all-round person to know," she said. "She used to say, 'When you're old, I'll look after you.' She won't now."